One year the house got painted by my own hand. There was some help from my two children. But my son was basically a slop painter. He only wanted to do large areas, none of the subtle work around windows. And although my daughter was better at the heights than I and could do trim, whenever she was ready to start painting a friend would come by and she'd be off someplace. So most of the work I did myself. One day, as I was scraping on the porch roof under the eaves, I disturbed a family of bees. Mind you, I don't like heights and wasn't all that comfortable on a slanting roof in the first place. But with one of those angry bees staring me in the face, just buzzing in place, I was doubly uncomfortable. So I swung at it with my putty knife and connected. The bee flew off, angry I guess, because a few seconds later it came flying back and stung me on the nose. So here I was on a slanting roof, panicked by an angry bee, my nose hurting, afraid I was going to fall off the roof. So what I did was what I usually do when I'm in trouble, called for my wife; who calmed me enough to come down the ladder to the ground and helped me get a home remedy paste on my nose. (I know she was smiling inwardly the whole time, or outwardly, behind my back). She said I looked funny, with a red, swollen and pasty nose. This was my first close-up and personal experience of bees. I'd watched interaction with bees from a distance before. There was the time a friend was stung while we were hiking in the White Mountains of New Hampshire. He had a bee allergy. I remember the panic we felt getting him down the mountain. Fortunately he didn't swell badly, or die. 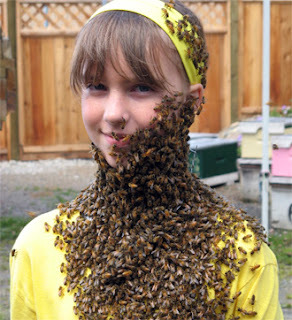 There was the time a whole host of bees invaded the downtown business area of the town where we lived in Maryland. People were frightened and panicked and business owners called the police. Instead of trying to kill them all with a flamethrower or spraying them with chemicals, someone had the good sense to call a beekeeper who brought a hive and took them home. And then there were the times I visited a friend who lived south west of Brookings on a rural acreage and kept a few hives of bees. They had lots of flowers and their hives thrived, except when the neighbor had aerial spraying of his crops and the wind drifted toward their hives. Those years, all the bees died. Bees are struggling these days. Slowly it's dawning on us how important they are to the functioning of a healthy food system. About one third of every bite we take goes into our mouths through the work of bees pollinating our crops. Approximately 130 different crops in the United States are pollinated by bees including apples, broccoli, almonds, watermelon, onions, cherries, blueberries and many other fruits and vegetables. 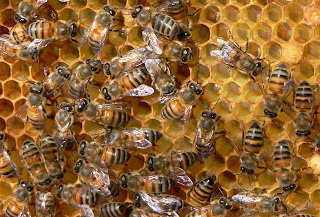 It's not just honey production at stake with colony collapse disorder and other bee die offs. Our dinner table is seriously at risk. As the crisis grew early last decade, the suggested culprits multiplied. Investigators identified the possible cause as bee mites, viruses, drought, even cell phones. But increasingly attention is centered on a particular pesticide, neonicotinoids, a nicotine derived pesticide European regulators implicate in bee deaths there. "The explosive growth of neonicotinoids since 2005," according to a recent article by Michael Wines in the New York Times, "roughly tracked rising bee deaths." This is a systemic pesticide, applied to seeds that travels into the plant and into the pollen the bees carry. They take it back to their hives. It's a neurotoxin and Dave Goulson, professor of biology at the University of Sussex concluded from his research, "Exposure to these pesticides, which are essentially a neurotoxin, was affecting the ability of the bees to learn, to find their way home, to navigate, to collect food, and so on, which is hardly surprising if you realize they're neurotoxins. ... What we found, which was I must admit surprising in its extent, was that the treated nests did grow more slowly, but most dramatically, the effect on queen production was really strong. So we had an 85 percent drop in queen production of nests that were exposed just for that two-week period to pretty low concentrations of these pesticides compared to the control nests." Since last year, when bee deaths averaged about 30%, the problem has grown. 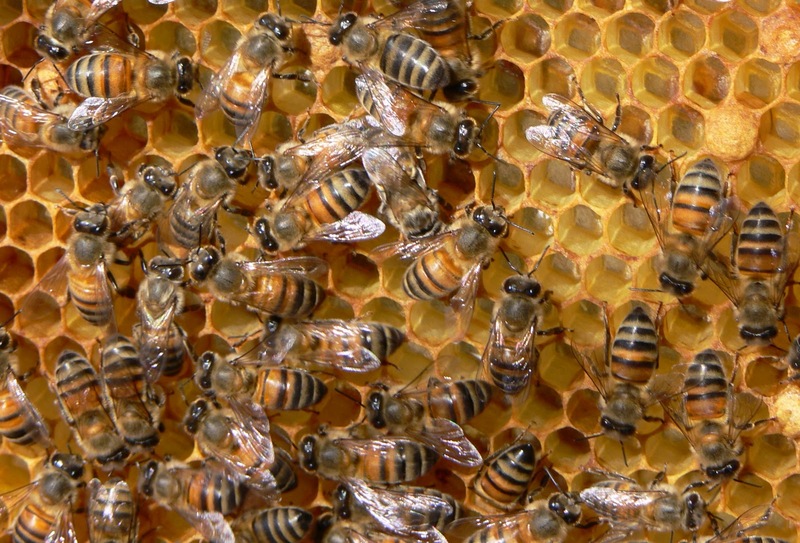 Now beekeepers are losing between 40 and 50% of their hives. Needless to say, the big chemical multinationals like Syngenta and Bayer, Monsanto and Dow, have mobilized their public relations firms, their legal staffs and their lobbying dollars to secure their bottom lines. Monsanto even purchased a major bee research company, Beeologics. It is another instance of a company creating a problem, then trying to create a technological fix for it, and making profits both ways. It seems to be a burgeoning strategy in the business world of multinationals. In the meantime, we'll have more flowers in our backyard than ever (chemically free). I'll continue believing that the wisdom implicit in the harmony of creation is healthier for us all than the experiments with nature being engineered in corporate labs through poisoning seeds and genetic manipulation. And if I paint my house this summer, as I should, I'll actually welcome a bee sting or two. It's all in respect for the wisdom of nonviolence and the harmony of creation.